MALLIN is a friendly family run ‘Bed and Breakfast’, set in the heart of the Cotswolds. Located in the lovely Saxon village of South Cerney, 3 miles from Cirencester, the location provides good access to Cheltenham, Gloucester, Bath, Oxford and Swindon. Also convenient are Burford, Bourton on the Water and the village of Bibury with its renown 16th century cottages ‘Arlington Row’. The Cotswold Water Park is also close, with its many lakes, offering bird watching, sailing, water skiing, walks, cycle tracks, paintball and fishing (course and game). There are also a large selection of golf clubs, restaurants, cafes and pubs available locally. MALLIN offers a double bedded room and a twin bedded room, with a shared bathroom, which has a bath and shower; with a separate room with tea and coffee making facilities, television and seating area. Additionally included is limited off street parking and WIFI internet access. 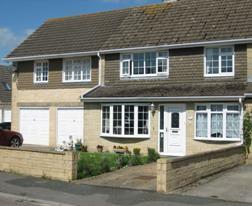 Local amenities include three pubs, shop and a Post Office, all within easy walking distance. Rooms are from £65.00 per night. Single occupancy from £45.00 per night. We do not accept children under the age of 10 years old. Credit card payments will incur a 2% processing charge. Mallins offers level car parking and access to the entrance. On entering guests are required to climb approximately 15 stairs to the accommodation. The shower is accessed by stepping into the bath.